The woman, a member of an underground Protestant community, denies having mental problems, but wants to spread the Gospel to change party members' "corrupt thoughts". In Wenzhou (Zhejiang), the authorities crack down on Christmas celebrations, deemed "Western spiritual pollution". Surveys indicated that some 60 per cent of university students want to learn about Christianity. In Beijing, 3,000 people are baptised on Christmas night. Zhejiang supplies 60 per cent of the world's Christmas decorations. Beijing (AsiaNews/RFA) - Chinese police detained a Protestant woman who on Christmas Day tried to put up placards outside the Zhongnanhai, the exclusive government and Communist Party headquarters, located near the Imperial Palace. Zhou Jinxia, who hails from the port city of Dalian in Liaoning province, tried to put up posters in a bid to "spread the gospel" to President Xi Jinping and his wife Peng Liyuan. One placard read, "God, who loves the world, is calling Xi Jinping and Peng Liyuan". After her arrest, the police took her to a psychiatric unit for a check-up, but she denied having any form of mental illness. For years, Zhou had tried to petition the authorities to obtain justice after she was evicted from her home without compensation. After several failed attempts, she joined an underground Protestant house church and has tried in the past two years to spread the Gospel in order to change the "corrupt thoughts" of many people in China. Xi Jinping's anti-corruption campaign possibly led her to hope that the president would bring justice to her, in the name of freedom of religion. Before police took her away, Zhou said she was not worried about her fate. "I will accept whatever comes," she is quoted as saying. Despite the amateurish nature of Zhou's action, such an incident shows that Christianity is becoming important for many people disillusioned by the corruption among politicians and members of the Communist Party. For several years, a virtual rush to convert to Christianity has been underway in China, both in its Protestant and Catholic versions. 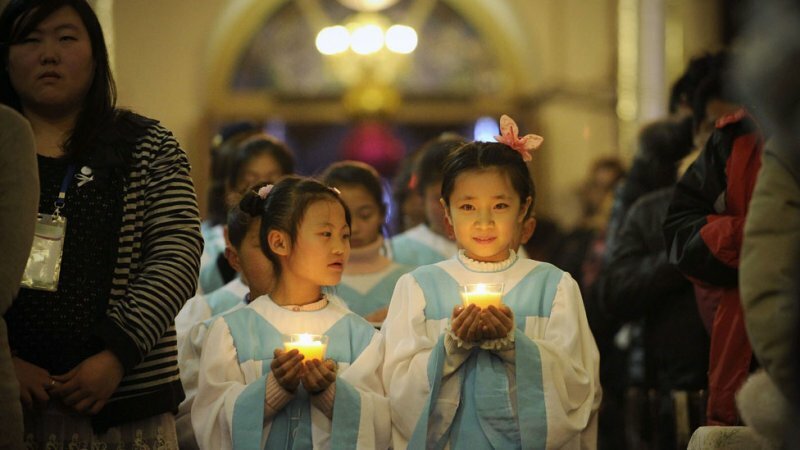 According to some reports, some 3,000 people, mostly young people, were baptised on Christmas night, in Beijing alone. In Wenzhou, the local Department of Education has issued a directive to limit Christianity's appeal to young people, banning Christmas events and celebrations in schools and kindergartens, deemed "kitsch" and "un-Chinese". The crackdown has also been spreading to universities and colleges nationwide. Since China opened up to foreign trade, Christmas trees, Santa Clauses, greeting cards and even crèches have spread widely. Although 25 December is a working day, thousands of young non-Christians attend church services in order to understand what Christmas is about. Eventually, many of them eventually sign up for the catechumenate and being baptised. According to a survey conducted a few years ago at universities in Beijing and Shanghai, at least 60 per cent of young people are interested in learning about Christianity. The directive issued by Wenzhou authorities is part of a wider pattern, which includes a campaign to tear down crosses and religious buildings launched in Zhejiang by the local party secretary whose primary purpose is to reduce the influence of Christianity in society, deemed "Western spiritual pollution." Ironically, Zhejiang - in particular the city of Yiwu - lives off Christmas. About 60 per cent of all Christmas decorations sold in the world are manufactured in the province.